Good Morning Everyone! 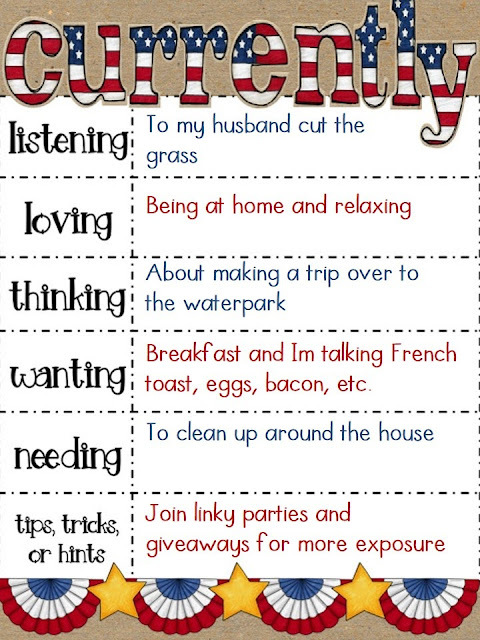 I am excited to link up with Farley at Oh' Boy 4th Grade for her monthly currently linky for July! Click the button to link up too! Now for my Currently July!!! I just woke up like 15 minutes ago. My hubby was no where in sight and then I here someone cutting grass. He woke up so early to cut the grass on a Saturday morning. I am shocked. We were still up at 2am. I just woke and I am still sleepy. How does he do it? I love to be at home and relax. Enough said! I may go over to the waterpark. If not, I could find a pool to go jump in. I really want a big breakfast. I know it is almost lunch, but breakfast can be eaten at anytime of the day. My tip was to join linky parties and giveaways. I gained so many new followers and friends from collaborating with others. Love a big breakfast! Don't do it that often, but yummy. Yes! Definitely don't need it to often. Breakfast! Yum! My hubby works every Saturday morning so sometimes we'll do a big Sunday breakfast. I hate that cooking it dirties about a million dishes! My kitchen can go from clean to disaster in no time! Glad you got in on the early Currently action, too! Lol. I quit sometimes too. I am actually ding good only because it is summer time. Breakfast is good anytime of the day! Water park or pool sounds fun- enjoy! Isn't a lazy Saturday the best?! This is my first one of the summer vacation! I just finished school yesterday! Yahoo! I love a good breakfast like that. When my grandparents were still alive, the weekends I was with my mom we would go over there on Sunday morning for eggs & sausage & toast....& mmm good! Love having a big breakfast, but it doesn't happen that often. Just stopping by for July Currently. I don't like a huge breakfast in the mornings, but for lunch or dinner...bring it on!! lol Happy 4th of July!